The user is viewing a detail page with certain content. He presses the menu hard key. The options menu slides into the screen, after which the user chooses the ‘Delete’ option. An alert dialog appears over the darkened screen, asking the user if he is sure he wants to delete the item. The user can choose to cancel or to go ahead deleting the item by tapping the OK-button. The user returns to the list where the item came from (or to the previous item in the set). A toast message confirms that the item is deleted. This toast is optional, but recommended when the nature of the action that has taken place asks for a confirmation. A dialog is usually a small window that appears in front of the current activity, making the underlying activity loose its focus. An alert dialog is a dialog that requires the user to take note of a message that relates to the current activity, by responding to it. This can be all kinds of activities, irreversible like deleting, or trivial, like 'Do you want to follow us on Twitter?' The activity needs input from the user, otherwise the action cannot take place. To get this response, the alert dialog can hold zero, one, two or three buttons, and/or a list of selectable items that can include checkboxes or radio buttons. An alert dialog is often combined with a toast message, confirming the user that the action has been taken. When the chosen action doesn't require a validating respond, you can settle with only a toast message. When you want provide the possibility to get a respond from the user (usually only to take note of) when an event has taken place in the background, you should use an event-driven notification. 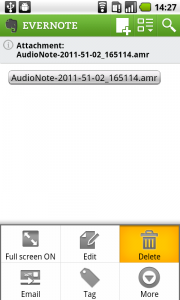 1 In this example an Evernote Audionote will be deleted. 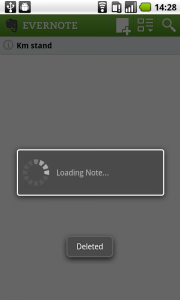 3 ... an alert dialog appears over the screen, and asks if you are sure you want to delete the note. 5 ... which is followed by a toast message, saying deleting the note is succeeded. 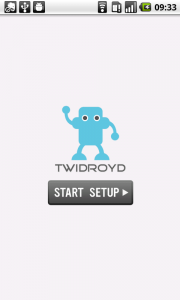 1 The start up process of Twidroyd contains a series of 2 alert dialogs. Or in the following example even 3, when the process isn't executed properly. 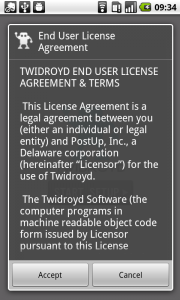 2 Upon commencing start up, the user has to accept or decline the end user agreement. 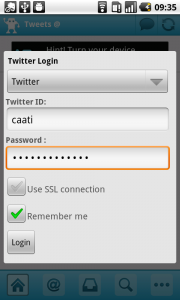 3 After agreeing, the user has to fill in his account details. 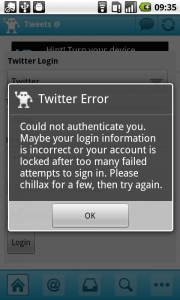 4 Something went wrong with entering the password, says the alert dialog. 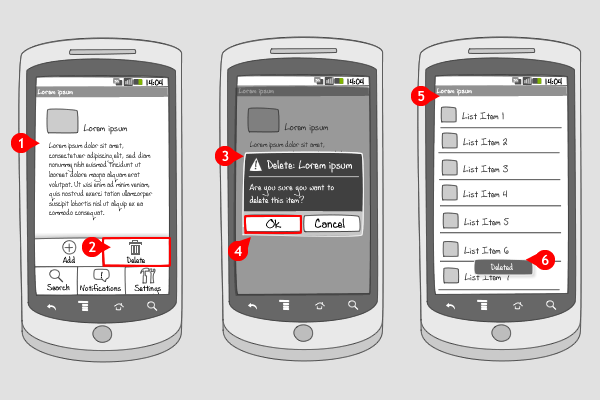 The user has to tap 'Ok' to tell the app that he has read the message. 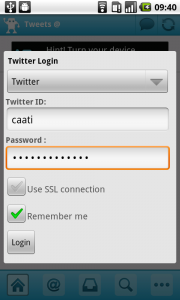 5 The user can enter the password again. 6 Signing in has worked. 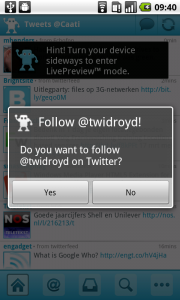 The Twidroyd app asks if you want to follow Twidoyd on Twitter in a 3rd alert dialog first. 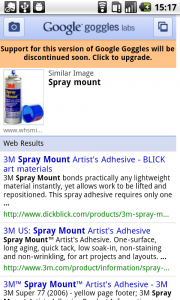 1 Google's Goggles shows a line of text, containg a link for upgrading it's current version. 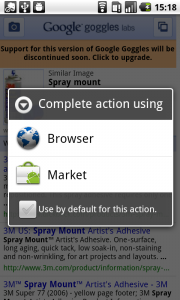 2 When the text is selected, an alert dialog appears, asking the user which application the action should be completed with. 3 At the bottom of the dialog, a checkbox can be selected, which makes sure the action will always be completed in the future with the selected application, and the alert dialog doesn't appear anymore. 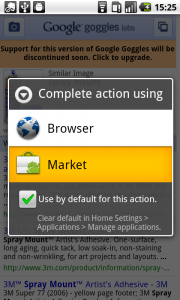 4 The Market is opened showing the Google Goggles app, which will be downloaded upon tap.